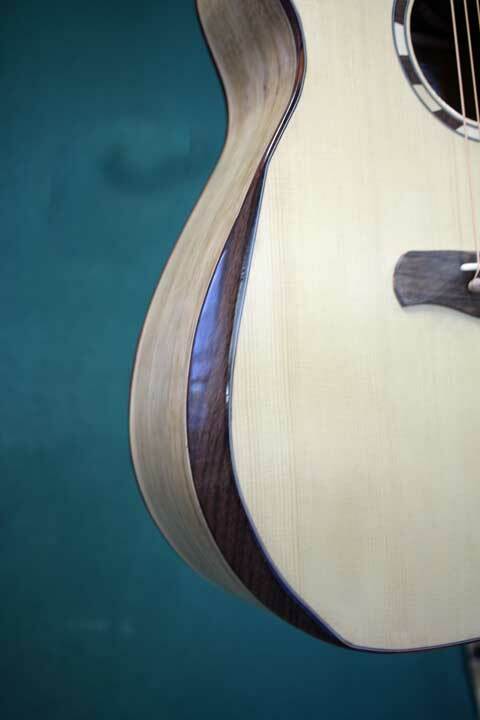 The Maury guitar, named after a significant whitewater river in Virginia, is a dreadnaught. The waist is pulled in to take out some of the boominess that inhabits a true dreadnaught. The fundamental remains strong, and overall the guitar sounds more balanced. (The Dreaded Maury model is a true dreadnaught with a fat waist.) Unless otherwise specified, these have a 25.4" scale length and 1 3/4" nut width. The body is 19 3/4" long and 15 1/2" wide at the lower bout. They are big and loud with a deep sound. This model is roughly the size of a dreadnaught. The waist is a bit more pinched than a typical dread to remove the boominess that affects many dreads. A true dreadnaught in size and shape. 114 - Persimmon back and sides. Engelmann top. Laskin armrest. 24.9" scale. Bright and warm at the same time. And, it's loud! A real pleasure to play. I am getting really fond of the sound of persimmon. 35- East Indian Rosewood Back and sides. the sound you expect from a Rosewood guitar, only more of it. 66 - Sapele back and sides. Sitka top. It sounds like Mahogany, but with more sustain. This one has a good, strong dreadnaught sound.